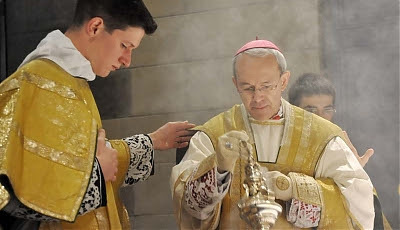 RORATE CÆLI: [UPDATE]: IMPORTANT: Bishop Athanasius Schneider interview with Rorate Caeli on "Profession of the Immutable Truths", communion for "divorced and remarried"
In our country people commit sin as elsewhere, but our people still acknowledge that sin is sin, and therefore for such sinners there is hope for conversion and Divine mercy. It would be for our people -- and even for the so-called “divorced and remarried” among them -- a kind of blasphemy to demand access to Holy Communion while continuing to cohabitate with a person who is not their legitimate spouse. Therefore, our Bishops’ Conference did not see the necessity to issue relevant norms. BAS: In the face of the current temporal and partial eclipse of the function of the Papal Magisterium concerning concretely the defense and practical enforcement of the indissolubility the marriage, the members of the episcopal and of the cardinalitial colleges have to assist the Pope in this Magisterial duty through public professions of the immutable truths which the Ordinary and Universal Magisterium -- that means what all the Popes and the entire episcopate during all times - have taught concerning the doctrine and the sacramental practice of the marriage. BAS: First, these faithful have to continue to read and study the immutable Catechism, and especially the great doctrinal documents of the Church. Such documents are theme here, e.g., the Decrees of the Councils of Trent about the sacraments; the encyclicals Pascendi from Pius X.; Casti connubii from Pius XI; Humani generis from Pius XII; Humanae vitae from Paul VI; the Credo of the People of God from Paul VI; the encyclical Veritatis splendor from John Paul II; and his Apostolic Exhortation Familiaris consortio. These documents do not reflect a personal and short-lived meaning of a Pope or of a pastoral synod. Instead, these documents reflect and reproduce the infallible Ordinary and Universal Magisterium of the Church.